People these days are in a constant process to improve their dwelling place, improve the ambience of one’s living place. Bathroom light fixture or simply manipulating bathroom lighting can completely change the way you live. It also gives a deep impact on your mood. One may replace the bathroom fixture own one’s own. Especially, the recessed, metal canister type of a flush mount may get over heated and hence result in burning of a socket wires and melting off the insulation and consequently results in malfunctioning of the socket. It may happen in case of a single socket or it sometimes is also responsible for many number of bathroom fixture on the circuit. One should always use a tester, at all times and should check that the issue is not with your switches. So now, you are ready to get it replaced. It is not considered a rocket science; however it requires some basic precautions. A well focussed and strategic work may get the bathroom lighting work in no time. The first step should be to turn off the power from the targeted area and ensure it with a help of a tester. The best way is to perform every electrical work is by wearing insulating gloves while performing. Secondly, one should remove the socket and unscrew the clip holding the socket and then disconnect the wires. One should get a replaced from a hardware store, which is easily available. Then one should carefully remove the bulb and cap nuts in the fixture and by loosing the fixture should try to remove it and push the canister slightly up into the ceiling. Then one should proceed after checking the power whether it is off or not. Only after disconnecting the fixture from the wire connection box, it is safe to remove the fixture and then cut back the wire about an inch. Then new fixture mounting strap, by connecting the black lead wire to the black circuit wire and corresponding wire accordingly. Later one may attach the bathroom lighting fixture’s base and install new sockets connect the circuit wire at the terminal screws. By reversing the process assemble it completely, before turning the power on. 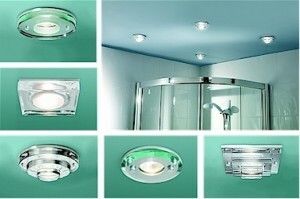 Here is your new bathroom lighting fixture easily replaced and set to use.